Every fall, Pomona College welcomes a special group of people to campus: new professors, visiting professors, lecturers and fellows. 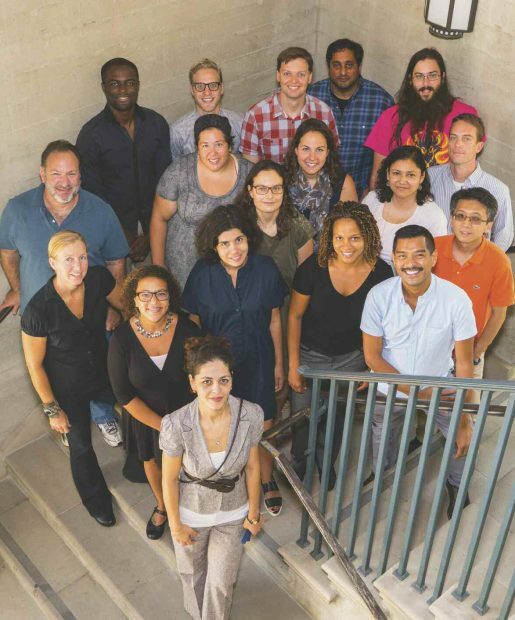 This year the College has a group of 36, including, from left to right: Back row: O. Maduka Ogba, Robbins postdoctoral fellow in chemistry; Mark Caspary, post-M.F.A. fellow in theatre and dance; Scott Medling, visiting assistant professor of physics and astronomy; Vivek Swaroop Sharma, visiting assistant professor of politics; Peter Andrew Mawhorter, visiting instructor in computer science; second row from back: Robin Melnick, instructor in linguistics and cognitive science; Kimberly Ayers, visiting assistant professor of mathematics; Jill Pace, assistant professor of physical education and women’s basketball coach; Tyler LaPlante, visiting assistant professor of economics; third row from back: Kara Wittman, director of college writing and assistant professor of English; Patricia Blessing, visiting assistant professor of art history; Guadalupe Bacio, assistant professor of psychology and Chicana/o-Latina/o studies; Lei Shao, visiting assistant professor of economics; fourth row from back: Nicole Holliday, Mellon Chau postdoctoral fellow in linguistics and cognitive science; Joanne Nucho, Mellon Chau postdoctoral fellow in anthropology; Carolyn Ratteray , assistant professor of theatre and dance (now tenure-track); Giovanni Ortega, assistant professor of theatre and dance (now tenure-track); and front: Katya Mkrtchyan, visiting instructor in computer science. Not pictured: Nani Agbeli, lecturer in music and director of the West African Music Ensemble; Richard Asante, visiting African scholar in international relations; Martha Bárcenas-Mooradian, lecturer in Romance languages and literatures; Zaylin Cano, lecturer in dance; Brett Hershey, lecturer in theatre and design; Rushaan Kumar, visiting assistant professor of gender and women’s studies; Whitney Mannies, lecturer in politics; Audrey Mayer ’94, lecturer in environmental analysis; Sam Miner ’06, lecturer in mathematics; Claire Nettleton, lecturer in Romance languages and literatures; Alexandria Pivovaroff, lecturer in environmental analysis; Elm Pizarro, lecturer in dance; Meagan Prahl, lecturer in theatre and dance; Andrew Sappey, visiting assistant professor of chemistry; Meghan Sisson, visiting assistant professor of physical education and men’s and women’s swim coach; Corey Sorenson, visiting assistant professor of theatre; Ousmane Traoré, assistant professor of history and Africana studies; and Samira Yamin, lecturer in art.